Each year, pastures in Emilia Romagna are sown with seeds of different grasses to give a varied and desired texture for the cows to enjoy. Because the cattle must follow the rule of grass feed for Parmigiano Reggiano there is careful and controlled feeding to ensure that the animals are getting the right amount of nutrients year-round. You will not see cattle grazing outside unless on very limited pasture as they are kept in open 'barns' where there is a constant supply of sweet grass and hay as well as water. This very pure fodder gives the milk its consistency and flavour. So much goes into the making of a wheel of Parmigiano Reggiano - there is certainly more to this cheese than meets the eye. All the laws, recipe and traditions surrounding this cheese are guarded and overseen by the Consorzio, even down to the way the cheeses are stored and matured. Made with unpasteurised skimmed milk from accredited dairies within the allotted region, the rind is brine-bathed and slowly matured on wood shelves under close supervision, in keeping with tradition. The wheels are checked for size and flaws, and any not meeting the strict code are distinguished by scoring deep markings around the outside of the cheese so that they cannot be sold on by the black market as Parmigiano Reggiano (these marked cheeses are used for grating in the food production industry). We hand pick ours from the premier quality section, aged at least three years. In May 2012 two major earthquakes struck Northern Italy causing wide-spread damage, notably toppling and smashing 10% of the region’s production of Parmigiano Reggiano, The King of Cheese. In Italy these became known as the 2012 Emilia Earthquakes and were made world-famous by Massimo Bottura’s ‘Risotto Cacio e Pepe’ which succeeded in helping to sell many of the broken wheels. Our producer of Parmigiano Reggiano was one of those affected by the earthquake. For him the damage was devastating - not only was most of his stock destroyed, but he was also forced to stop production for some time. Thankfully, however, he teamed up with his neighbour through the dairy co-operative Le Marzette to continue making cheese. With the first of these new wheels coming soon to our shop, we are delighted to host an event celebrating the return of this cheese which is a testament to the resilience of the people of Emilia Romagna. On 26th September from 7.00pm to 10.00pm we will be hosting a special supper at our Marylebone shop. Taste Parmigiano Reggiano from a freshly opened wheel, and enjoy a regional supper showcasing the beauty and complexity of this fabulous ingredient. A portion of the ticket price will be donated to a charity in support of rebuilding the area. The ticket price also includes dinner, wine pairings & Parmigiano Reggiano Gift Bag to take home. For more information, view the full event details here. Bring the stock to a gentle simmer in a medium saucepan. In the meantime mix together the remaining ingredients in a bowl. If the resulting mixture seems a bit too wet & sticky, add flour a tablespoon at a time until it comes together as a soft dough. Adjust seasoning as needed. Divide the mix into 4 balls & press the dough through a potato ricer to make small noodles - they should be at least 5cm long. Gently drop the passatelli in the simmering broth and cook for just a couple minutes until they begin to float. 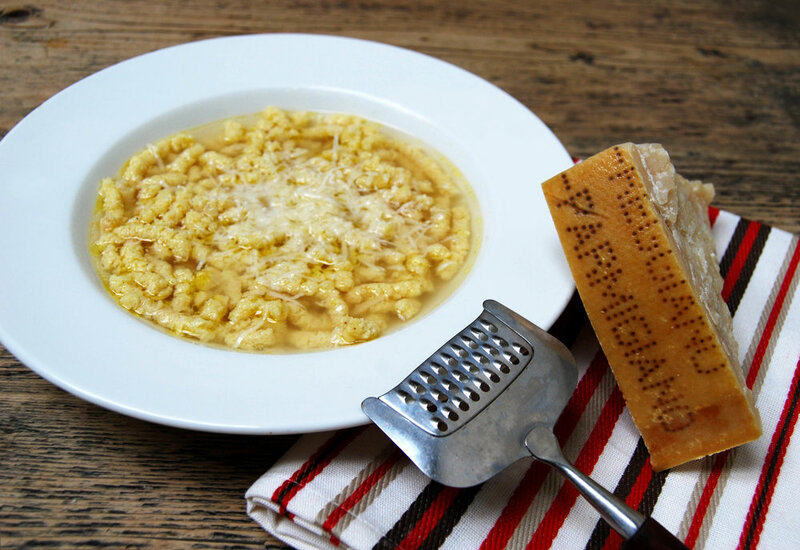 Serve the passatelli with the broth & grate a generous amount of Parmigiano Reggiano on top to serve.